Welcoming startups to Chitkara University’s 3rd edition of EARN WHILE YOU LEARN programme. We wish to invite you to be a part of this programme. 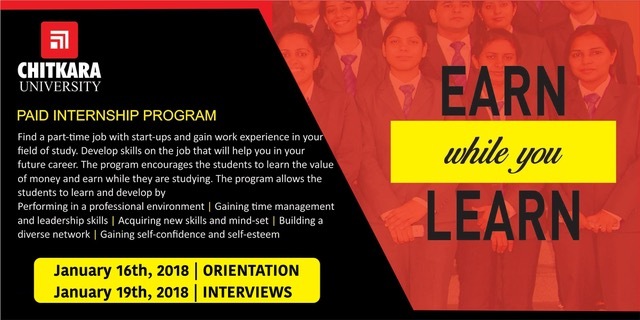 In last two editions, over 30 students were hired for internships with 12 startups.Over 350 students appeared for last two editions of EARN WHILE YOU LEARN programme. Venue: –Explore Hub, Chitkara University, Punjab Campus. Founder or HR Head of any startup can participate. Centre for Entrepreneurship Education Development (CEED) , Chitkara University, Punjab is providing a part time internship opportunity “Earn While You Learn”. It is a paid Internship program with a stipend of INR 5000 to INR 7000 wherein the startups from the region around will be coming to hire the students. Students can earn while being in the campus and working from the home or hostels for these startups. Selection procedure will be based on the skills of the student and interview. With this opportunity student can utilize their free time and can develop their skills of time management, leadership, building diverse networks etc.